Vik Muniz (Portuguese pronunciation: [ˈvik muˈnis]; born in 1961, São Paulo, Brazil) is a Brazilian artist and photographer. Initially a sculptor, Muniz grew interested with the photographic representations of his work, eventually focusing completely on photography. Primarily working in series, Muniz incorporates the use of quotidian objects such as diamonds, sugar, thread, chocolate syrup and garbage in his practice to create bold, ironic and often deceiving imagery, gleaned from the pages of pop culture and art history. His work has been met with both commercial success and critical acclaim, and has been exhibited worldwide. In 2010, Muniz was featured in the documentary film Waste Land, directed by Lucy Walker, which featured Muniz's work on one of the world's largest garbage dumps, Jardim Gramacho, on the outskirts of Rio de Janeiro. The film was nominated to the Academy Award for Best Documentary Feature at the 83rd Academy Awards. 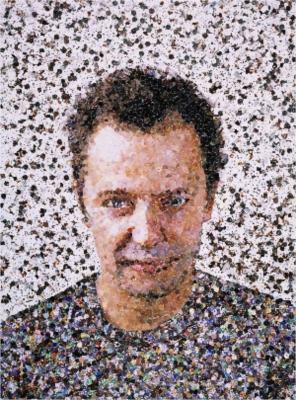 Vik Muniz received a scholarship to art school because of his drawings. At the age of 18, Muniz worked in advertising in Brazil, redesigning billboards for higher readability. While on the way to his first black-tie gala, Muniz witnessed and attempted to break up a street fight, where he was accidentally shot in the leg by one of the brawlers. He was paid by the shooter to not press charges, and used the money to travel to New York. After his arrival in New York in 1983, Muniz's friend lent him a studio, and he started his career as a sculptor, which resulted in his first solo exhibit in 1988. Muniz is best known for recreating famous imagery from art history and pop culture with unexpected, everyday objects, and photographing them. For example, Muniz's Action Photo, After Hans Namuth (From Pictures of Chocolate), a Cibachrome print, is a Bosco Chocolate Syrup recreation of one of Hans Namuth's photographs of Jackson Pollock in his studio. The monumental series Pictures of Cars (after Ruscha) is his social commentary of the car culture of Los Angeles utilizing Ed Ruscha's 60's Pop masterpieces rendered from car ephemera. Muniz often works on a large scale and then he destroys the originals of his work and only the photo of his work remains. Muniz has spoken of wanting to make "color pictures that talked about color and also talked about the practical simplification of such impossible concepts". He has spoken of an interest in making pictures that "reveal their process and material structure", and describes himself as having been "a willing bystander in the middle of the shootout between structuralist and post-structuralist critique". He cites the mosaics in a church in Ravenna as one of his influences. Muniz says that when he takes photographs, he intuitively searches for "a vantage point that would make the picture identical to the ones in my head before I’d made the works", so that his photographs match those mental images. He sees photography as having "freed painting from its responsibility to depict the world as fact". Vik Muniz cites many people as his inspirations. He is a self-proclaimed student of Buster Keaton. He decided to become an artist after seeing the works of the Postmodernist artists, Cindy Serman and Jeff Koons. Muniz, like both of these artists, also reworks popular imagery in his work. Muniz says that he does not believe in originals. Rather, he states that he believes in individuality. Muniz works to repurpose themes and showcase these old themes in a different light for the viewer. Artworks of Vik Muniz are removed from WikiArt due to a copyright infringement notice. Action Painter (from Pictures of Chocolate), ? Andy Warhol (From Pictures of Ink), ?